On May 30, 1927, the Albert Wisner Memorial Library was presented to the public by Mrs. Annie Wisner Dunlap on behalf of her great-aunt and adoptive mother, the late Mrs. Albert Wisner. Ever since that day, this building has provided a place for the community to connect with the worlds of literature, information, and lifelong learning. Through its doors every day a host of different people with diverse interests, educational levels, and cultural and religious backgrounds, enter and meet. Here, everyone is regarded equally. The best deal in town has helped raise generations of literate, inquiring minds; aided its citizens in securing good jobs or starting new businesses through updated knowledge of their career fields; provided a place of refuge for quiet study and exploration of ideas old and new; assisted in locating helpful information for the sick, the grieving, the troubled; and provided access to those stories of life, love, adventure, triumph over adversity, and the full range of experience that the human spirit craves. This is a public library, and it is for these purposes and goals that public libraries were established as part of the fulfillment of the ideals of the American democracy. To accommodate the reading people and patrons of the limited library of the Young Men's Christian Association, the board of managers have secured No. 16 of the State Traveling Libraries. The rules governing the libraries are as follows: Readers over 16 years of age must sign a contract and agreement; readers under 16 years of age must sign a contract endorsed by a trustee; all persons, whether members of the association or not, are entitled to draw books. A partial list of books are as follows: Politics for Young Americans, Nights with Uncle Remus , Farmer's veterinary advisor, Little Women, Jane Eyre, Little Lord Fauntleroy , Last of the Mohicans , Robinson Crusoe. In 1898, it was reported that the current traveling library had circulated three hundred times! By 1907, the local collection consisted of more than 1,200 volumes. Reading was vitally important to the local population, as shown by the fact that the local newspapers of the day usually carried various announcements regarding new books, discussions, and lectures. Even though the service was popular, for reasons that are unclear -- perhaps funding or staffing difficulties -- by World War I there was no longer any free library in Warwick. The need and the loss did not go unnoticed, however. Corner of Main St. and Colonial Ave. before construction of the library, around the turn of the century. Sanford Memorial Fountain at left. House on right was then the 3rd oldest standing in the Village, replaced by the library. I direct my executor (Annie Wisner Dunlap), to cause to be incorporated the Albert Wisner Memorial Library for the establishment of a public library at Warwick, New York, as a memorial to my late husband, and I give and bequeath to the said corporation the sum of $100,000, out of which I direct the expenditure of not to exceed the sum of $50,000 for the construction and equipment of its library building. I direct the difference to be set aside and retained as a perpetual endowment fund. Through the next several years, the Board of Trustees selected a site and plans for the library. The specifications for the building were drawn up by Morgan, French & Co. of New York , completed April 20, 1926 and put out to bidders. It was a very detailed document, even including provisions for the roof slate, the varnish brands to be used on the interior woodwork, and the type of marble to be used in the restrooms! One can easily imagine the many discussions on the design and materials that preceded. 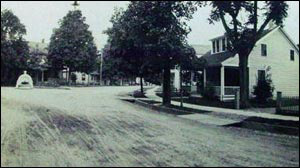 The corner selected at Main Street and Kings Highway was also home to the historic Baird Tavern and the Wawayanda House hotel of Frank Forester fame. The library would replace one of Warwick 's oldest homes. The process of planning and construction was not without its challenges, as evidenced by a hotly-worded letter to the editor by a member of the YMCA staff, reminding the public of its role in initiating these services, during the planning of the building. Simply and unostentatiously the handsome building and equipment of the Albert Wisner Memorial Library was presented to Warwick , Monday afternoon at three by Mrs. Annie Wisner Dunlap, wife of Theodore Dunlap of Chicago . The presentation (to Mayor John M. Deming) was made on the front steps of the building. This beautiful red brick and marble trimmed building, sort of old time in lines, will welcome to our valley lovers of books. Miss Harriet Dart, of New London, Conn., the librarian, was also there to welcome visitors and to invite them to register. The ink well that was used was one presented to the late Fred Pond, the sporting writer Will Wildwood, and was loaned for the occasion by Florence L. Ketchum, Editor of the Dispatch. A long list of registrants that day is recorded, with many of the names familiar in Warwick history. After a few final preparations the Library opened its doors for use by the patrons on June 15 after nearly four years of planning and construction. When the library opened, any resident of Warwick Township could take books out, including children in the third grade and up with their parents' permission. Albert Wisner was born around 1834 at the Wisner homestead, the historic stone house on lower Wisner Road still standing today. He left at the age of 18 and started out for the frontier of the West. There was yet no railroad, and so he made the arduous journey by land and water to Chicago, and served an apprenticeship in Ft. Dodge . During these years he recognized the opportunity that the land in and around the growing city presented, and became a real estate broker. He made his home and office at the corner of State and Dearborn Streets, and prospered. Alas, his home was destroyed in the Great Fire of 1871 that leveled much of the city of over 25,000, and all that he had left were the clothes on his back and what money he had in his pocket. He re-established his real estate office and as the city rebuilt, he again became a man of substance. Eventually he met his future wife, Annie Furness , who had often visited the home of Mrs. Samuel Stewart in Warwick and had come to love the town as well. Husband and wife both had astute business acumen, and together they worked in Chicago, played, and traveled widely in Europe and Africa as their wealth grew. Their traveling acquaintances included Mark Twain and H. Rider Haggard. Yet always they returned for visits to Warwick, which they considered their true home. When preparations for the Columbian Exhibition were underway, they moved into their new Chicago house before it was finished so that they could make it ready: everybody in Warwick will be coming out to the Fair, and we've got to have a place to entertain them! Albert Wisner never wanted nor owned a car, but sometimes rode in the one his wife purchased with her initials on the door, so that no one would mistake it for his own! He was a man of twinkling brown eyes, deep set under heavy brows, snow-white hair and beard, and a gentle, kindly, humorous smile. His wife Annie had the same quick smile and tenderness for the young folk. It was in children, perhaps, that Albert Wisner was the most interested, and yet the Wisners seem to have never had children of their own. He was never happier than when the holidays brought many of them around to the old stone house and he could join in their merrymaking, and live over again the days when he explored the land for miles about. When he and his wife passed away, this love for Warwick and its children became even more apparent with their generous gift to its citizens. 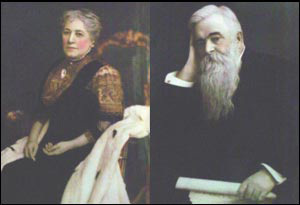 The old portraits of them both that hang in the library today were presented by Annie W. Dunlap for the building's dedication. The population that the library served during its early years was 2,471. There were 472 card holders a few weeks after opening! For twelve years it operated on income from the endowment, with many of its books coming from the old Y.M.C.A. library and early donations. It is the desire of the directors and the librarian to serve the entire community and although the number of books on the shelves at present is small, we have the nucleus of an exceptionally fine collection. We have books on hunting and fishing, birds, butterflies, and wild flowers, there are handy garden books, vegetable gardening, crops and fertilizers, orchard growing and strawberry cultivation, farm management, marketing of farm products, milk, butter, and cheese making, mechanical subjects, hand-made rugs, antique furniture, pewter, china, glass and silver, house building and plans, interior decorating, cookbooks, novels, biographies, shelves of travel and history, poetry and essays. For the child there are books of inventions, directions for making kites, bird-houses and playing games, fairy tales, stories of adventure, stories of long ages and far away and here and now, all by the best authors of children's literature. The librarian and the members of the book committee (of the board of trustees, to help select books) each make a list of books each month. Try to have them ready for circulation by the second of each month. People boarding or working for only a short time at Red Swan Inn, Central House, Demerest House and Paul Mezey's at New Milford must deposit two dollars which will be returned when they leave. This listing of historic hotels in the Valley hints at the role these institutions and their well-to-do guests from Manhattan and other areas played in the culture of the community; the library was part of the social fabric even for visitors, during Warwick's Golden Age. By the time this document was written around 1929, people who lived in the following places could take out books: Warwick, Florida, Sugar Loaf, Lake Wisner, New Milford, Greenwood Lake, Pine Island . Our assumption is that this refers to Post Office address, and covers the entire Town. Then came the Great Depression. The investments made for the library were suddenly making little or no income, and there were insufficient funds to carry on. The library trustees presented their case to the Village Board, which even in those terrible economic times agreed to provide tax money rather than have the service shut down. For many years the funding that the Village provided, and later the Town as well, was able to keep the library in operation according to the standards expected by its community. Would strongly recommend that Warwick with its good collection and trained librarian (Mrs. Douglas Stidworthy) take a more active part in the library interests of the region urging untrained librarians to seek advice. It is interesting to note that at this early date it was already common practice to send out for items to the State Library when not owned in Warwick. As the Village and surrounding Town grew in population, however, so did the concept of what libraries could and should be doing. The 'information explosion' had begun, and new expectations for access to information and books arose, largely as a result of the invention and proliferation of computers and electronic mass media. New paths of cooperation and sharing of books and other library items were opened up to supplement what one library alone could do when the State of New York established its regional library systems. Albert Wisner Memorial Library became a member of the Ramapo Catskill Library System on Oct. 11, 1960. Sharing of books and other library materials among public libraries was becoming easier. By the late 1960's as costs and the population served escalated, it became increasingly apparent that in spite of additional financial support from Town and Village general tax levies, the library could not continue even basic services at its current funding level. The concept of becoming a school district public library, drawing funds from a wider tax base, was explored. On June 9, 1971 a first vote was organized to change to a school district public library, with a budget of $60,000. It was defeated. It was apparent that the struggling library needed its community's support in order to continue fulfilling its mission. The Warwick Branch of the American Association of University Women, which had been sending members to help with story hours and clerical tasks, again stepped forward to help. On November 21, 1972 the AAUW Library Committee organized the Friends of the Library. They were one of the first organized Friends of the Library groups in Orange County . They have been helping the library with volunteers, fund raising, and support of its book collection, programs, and equipment ever since. In 1992 they held a special 20th year anniversary celebration at the Sanford home. In recent years they have raised funds through book sales, perennial plant sales, bridge tournaments, and pyramid parties, and were very active in the library's ongoing efforts to gather support and funds for a new facility. In 1973, Mrs. Annie W. Dunlap, who had in 1927 dedicated the library, and had served as its president from her Chicago home for almost 45 years, passed away. She left a $10,000 bequest that the trustees used to finish the basement area for a Children's Room. The new Children's Room was opened on June 9, 1973. Until this time, the children and children's programming had used a corner of the library's single room. Additionally, meetings and programs could be held in the newly-improved basement area. Mr. James Kaufmann , Pres. The first library director to serve the library under its new organization structure was Mrs. Patricia Schmotter. In 1975 the library was refurbished and improved and a small parking lot was added behind the library. On June 15, 1977 , the library celebrated its 50th anniversary. Members of the Buckbee family and other members of the library community gathered to see displayed memorabilia, have refreshments, and celebrate. A good deal of the actual work of maintaining the library had fallen to the trustees over the years; First Vice President Albert Buckbee , who served on the board from 1927 to 1961 and was a member of the Wisner family and a founding trustee, often was called upon. Library chores from starting the coal fire and cleaning the ashes, shoveling snow and cleaning the gutters with young Wisner Buckbee holding the ladder and washing windows were part of the Vice President's job.? In 1979 the library opened a branch in Pine Island on Pulaski Highway in the old Pine Island Hotel. It served residents of the area for seven years, but was closed in 1987 due to a large increase in rent and low circulation. By the late 1970's, it was abundantly clear to the Library's staff and trustees that the building given to the community 50 years before could no longer adequately serve the growing community. Warwick was undergoing a population explosion as new residents from more crowded areas nearby sought the lower housing prices and taxes that Orange County offered. Even with using the basement area for children's services, either the library would cease to serve as a vital part of the community if it did not grow. The decision was made to expand the library, using the remaining land the library owned for an addition. In order to ease the impact on the taxpayers and allow for passage of these plans, however, it was necessary to do everything possible to raise the funds by alternate means. The library possessed just one treasure that could help. In 1956, local historian Grace Bennett had given to the library an oil painting done by the well known Hudson River School artist, Jasper Cropsey, who resided in Warwick for a time. A portrait of Wickham Lake, it was now extremely valuable. After agonizing over this decision, the Library Board realized that the escalating price of the artwork would help pay for the library's addition, and selling it would remove the worrisome burden of providing adequate security for the painting in a public building. After consulting with Mrs. Bennett, it was sold for $50,000, a record price for a Cropsey, in the spring of 1980. The sale was not without controversy, however, as a number of local citizens expressed disappointment that the picture had been removed from the community. In an ideal world, such choices would not have to be made, but Albert Wisner's legacy had had to grapple with financial reality and strive to meet the demands of a growing citizenry many times already. The sale of the painting enabled the trustees to begin the process of planning for an addition to the now extremely-cramped library. In 1983 construction was begun, adding another level and a lobby area. The new addition, designed to blend in perfectly with the existing exterior architecture, was dedicated on Dec. 11, 1983. It increased the library's area to around 5,000 square feet. The lobby area's ground level entry provided handicapped access to the circulation desk and a few types of library materials for the first time in the library's history. Hours were extended, and the increased space allowed for acquisition of many new books. Collections of diverse materials such as books on cassette, videos, etc. that the public now expected could also be expanded. During the 1970s, 1980s, and 1990s, Warwick saw an unprecedented growth rate. As the population surged, by the mid-1990s it became apparent that the expanded facility would not serve much longer. Programs for children were so oversubscribed that the staff was forced to institute a lottery system to choose which preschoolers would benefit from its early literacy services such as story times. Despite the physical and financial challenges of the facility, the library continued to advance and embrace new services and technologies as they became available and in demand. In May 1995 the library began circulating and cataloging books using the computer system that the Ramapo Catskill Library System developed. It became much easier to locate books at other libraries and request them. The library began contracting for magazine and information databases on behalf of its patrons, and remote access at home to the catalog to request books and access the full text of many magazines, journals, and reference books became a reality in the late 1990s. The cyberpatron was born. The library began offering public access Internet and word processing workstations in the mid 1990s. Cramming what would fit into badly needed former seating space, Wisner Library's two public computers offered the only place in the Warwick Central School District school children and adults who did not have Internet or computers at home could go to freely access information on the Web or prepare their reports, resumes, and other tasks for which a computer is necessary. Lack of enough seating space and inadequate book stock, not enough computer workstations, no handicapped access to the book collections and catalogs, and lack of space for programs provided extreme challenges for the library to meet its role as the community's information and reading resources center. Recognizing this, the library Trustees and Director Margery Cyr launched a campaign in 1997 to build a new facility, as the land-locked library had no more room for expansion. 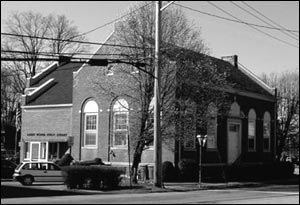 After intensive gathering of information and opinion from many quarters of the community, a vote for a new library was held on April 28, 1998 and was defeated. The community had just authorized multi-million dollar school building projects, also necessitated by growth of the community, and taxpayers did not feel confident another increase could be borne at that time. The library continued to operate within these difficult circumstances for several more years, while still looking toward the day that a new facility would make it possible to provide the kind of updated services that the community needed. The Board of Trustees was determined to make that a reality, and under the leadership of Library Director Rosemary Cooper, a plan to move toward that day was pursued. In September of 2006, Leyland Alliance, with the guidance of Executive Vice President Lou Marquet, donated a 2.2 acre parcel of land on McFarland Drive valued at $300,000. The land was within the Village boundary, only half a mile from the existing library, and would provide adequate space for a new facility and ample parking. With the site of the new library now in hand, a campaign to gain approval of a new building gained momentum. A referendum for an $8.5 million bond was approved by the voters of the Warwick Valley Central School District on Thursday, March 8, 2007. The architectural firm of Butler, Rowland and Mays, which had designed other library buildings, was selected. Paul Mays devoted many hours to studying Warwick’s architecture, and a design which reflected the agricultural heritage of the area was created. The plans also incorporated elements which would minimize energy consumption through use of natural sunlight and geothermal energy, and be as “green” as possible while still keeping an eye to the most efficient use of the public’s tax dollars. The groundbreaking ceremony was held on May 29, 2008, with a parade from the old library site to the new, featuring a horse-drawn carriage with members of the Historical Society dressed as Mr. and Mrs. Albert Wisner, and local school children. The new building’s site is adjacent to Veteran's Memorial Park, and a woodland footpath was created leading from the ball fields to the library site to enhance enjoyment of both resources. As building commenced, many people drove by the check on the progress regularly. Click here to see photos of construction. The Library Foundation had succeeded in raising over $200,000 in its capital campaign, and donated $100,000 toward an enhanced collection for opening day. Click here to see a photo slideshow of a tour of the new building while under construction. The doors of the old library closed for the last time on Sunday, October 18, 2009. Click here to see the farewell photos. A library moving company arrived the next morning, and completed the transfer and re-shelving of materials in the new building by October 22nd. Library staff spent four weeks organizing the collections, receiving and processing thousands of new books and audiovisual materials, installing and configuring computers and preparing to welcome patrons to the new 20,000-square foot space. The Grand Opening of the new library was held on Sunday, November 15, 2009. Click here to see a photo slideshow of the event. On November 22, 2010, the District School Board approved the sale of the old library building to the Town of Warwick Historical Society for $310,000. The proceeds of the sale were used to help pay down the bond on the new building. As soon as the new library opened, the community flocked in. In addition to a larger book and media collection, there was an expanded digital collection. The new building also provided community meeting and educational space. Ten public workstations with an additional ten for computer education and technology inclusive programs were also available. An increased ability to offer public programs expanded the cultural connections for Warwick’s citizens. The library gradually developed a full calendar of educational and special interest events for all ages. In the 2014-2015 fiscal year, the library had over 20,000 people attending more than 1,300 programs, with over 183,000 visits in person and 132,000 visits online. As the reading habits of many people began to shift from print media to ebooks and other digital content, the number of “checkouts” of ebooks rapidly rose -- making the library a truly 24/7 resource for the community. With an expanded volunteer program, the number of donated hours per month rose to more than 400 by January 2015. The Albert Wisner Public Library Foundation under the leadership of Donna Applegate, Gerard Benedetto, Colleen Larsen, and Glenn P. Dickes - which had been instrumental in securing the new building - now became a major supporter of high-quality public performances and enhanced services. Many events have been sponsored by Glenn P. and Susan D. Dickes. The Friends of the Library manage the active “Friends and Book Ends” used book store on the lower level of the library, which is open seven days a week. They also continue to support the library by donating a substantial amount toward operating funds each year. They donate time and volunteers to the Warwick Children's Book Festival as well as to other events such as the 5-Years New Celebration of the new library building and as docents for the Reading and Writing with Anne Frank Exhibit. It has become such a popular destination that the 60-space parking lot frequently overflows; plans for an expanded parking lot are underway in collaboration with the Village of Warwick, NY State and Ramapo Catskill Library System. In recognition of the high level of services and programs offered, in January of 2016 Library Journal magazine in collaboration with the Bill & Melinda Gates Foundation named the Albert Wisner Public Library the Best Small Library in America 2016. In early April Library Director Rosemary Cooper, supporters and staff members travelled to the American Library Association’s biennial conference in Denver, Colorado to accept the prestigious award. The $20,000 cash award was used to further enhance services. The library held a community celebration on June 12, 2016. April 7, 2016: pictured from left to right are Friend of the Library Susan Supak, staff members Lisa Laico, Stacy Kraai, Lauren Angle, Director Rosemary Cooper, Kathleen Georgalas, Kathleen Koopman and Friends of the Library President Colleen Larsen. Photo taken at the Denver Art Museum. Our Libraries Yesterday and Today in Warwick, by Constance Brown, 1976; updated 1985; designed by Ingrid Large. Cover illustration used with artist's permission.